It turns out Philippe Coutinho’s monster goal in the first half of Brazil-Switzerland was not a harbinger of things to come. Brazil had about a 20 minute stretch of transcendent, dominant play, oriented more or less around Coutinho’s golazo, but spent most of the rest of the match squandering possession and looking irritable and out of sorts, and now they’re another traditional soccer powerhouse that could do no better than a draw in their World Cup opener. After closing the first half looking sloppy and bored, maybe Switzerland’s equalizer would shock Brazil back to life? That would’ve been a reasonable expectation, but it never really came close to happening. 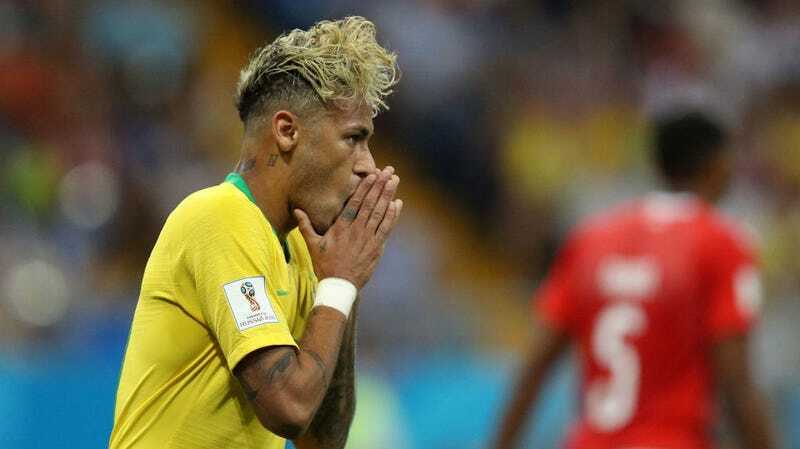 Neymar had a lovely, sinking strike gathered up easily by Swiss keeper Yann Sommer, and both Firmino and Fernandinho failed to capitalize on solid chances late, and Brazil finished the match with just five total shots on goal. Neymar was especially disappointing: Early in the match he seemed to be distracted by Switzerland’s physicality, and he just never really did anything cool or memorable at all. So now Argentina, Brazil, and Germany have all disappointed against inferior teams in their openers, and none of those three plus Spain have done better than a draw. What a crazy start to the 2018 World Cup.